In the spring of 1775, Fort Ticonderoga fell to the forces of Ethan Allen and Benedict Arnold, giving the rebels a hold on the strategic spot between lakes Champlain and George. American leaders contemplated their next move and learned that a British army was being formed in Canada under Sir Guy Carleton. It was hoped that an invasion of Canada by the Americans would ignite rebellion there and disrupt British war plans for invading the rebellious colonies. George Washington, with the approval of the Congress, authorized a northern strike under the command of General Philip Schuyler. Brigadier General Richard Montgomery was to lead the advance party from Ticonderoga and, according to the plan, later join with Schuyler and their combined force of 1,100 men outside Montreal. Montgomery was less than thrilled with his army, complaining that he had all generals and no soldiers. Nonetheless, he departed in late August and was quickly able set up a siege outside of St. John’s in Canadian territory south of Montreal. That position fell to the Americans in early November, but Schuyler was not able to participate on account of ill health. British strength in Canada was not great and it was decided not to contest the Americans at Montreal and instead remove their forces to the more easily defended fortress at Quebec. Montgomery occupied Montreal on November 13 and later left 800 men there to hold the city while he led his remaining force of 300 men toward Quebec. Meanwhile, also acting under orders from Washington, Benedict Arnold had gathered a force of over 1,000 men at Cambridge. 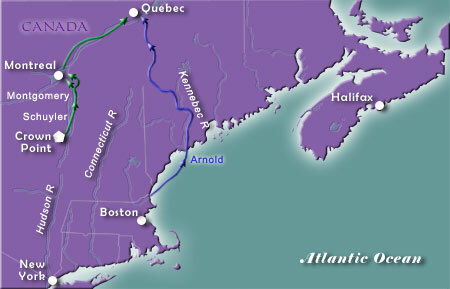 In September, they had set sail from Newburyport to Gardiner, Maine, intending to converge on Quebec in concert with the Schuyler-Montgomery force which would proceed along the St. Lawrence River. Arnold and his men had the more difficult task. The initial push up the Kennebec River on flat-bottomed boats was relatively easy, but after that the army had to make a long portage over very difficult terrain. Making matters worse, winter conditions came early to backwoods Maine. Wind, ice and snow slowed the advance through swamplands and over mountains. Provisions ran low and the men resorted to eating their dogs and attempting to eat their moccasins. In late October, one division returned home. On November 8, Arnold’s army, then numbering about 650 men, arrived on the banks of the St. Lawrence. The British had been warned of their approach and had taken the precaution of destroying all of the boats on that portion of the river, excepting their warships. The Americans had to forage over great distances to secure enough birch bark and other essential for the construction of canoes to cross the river. With that task completed, the Americans were able to slip past the British fleet on November 13. Arnold and his men scaled the cliffs outside Quebec, arriving on the Plains of Abraham — the scene of the most famous battle of the French and Indian War 16 years earlier. Arnold hoped to repeat that earlier success by luring Carleton into an open fight outside the city. The British commander, however, had served with James Wolfe and was not inclined to repeat Montcalm’s mistake. Despite his numerical superiority, Carleton remained within the fortress. Lacking sufficient manpower and ammunition, and with British reinforcements on the wary, Arnold decided not to attack and pulled back to a position about 20 miles upstream from Quebec. The enlistment term of many of the American soldiers expired on January 1. Therefore, at 2 a.m. on December 31, the armies of Montgomery and Arnold launched an attack against the strongest fort in North America during the height of a blinding snowstorm. Montgomery fell mortally wounded in the initial assault and later Arnold had a bone in his leg broken by a musket ball. The American attack failed utterly; 100 were killed and about 300 captured. A wintertime march back to American territory would have been certain death. Arnold’s army remained outside Quebec and suffered horribly from the cold and the lack of food. In the spring, reinforcements arrived, but the decision was made to forego any further offensive. The American retreated to Montreal, where they were joined by the occupying forces and all marched south to the safety of Crown Point with Carleton and a British army at their heels. During this retreat, Arnold provided some of his most impressive service, harassing his pursuers and making their lives miserable. Dispirited British soldiers later returned to Montreal. The American leadership had totally misjudged anti-British sentiment in Canada. No uprising occurred and Canada remained British. See timeline of the War of Independence.